On his blog leander has added a post which shows how he has set up a icecast streaming solution together with an RTL-SDR dongle which is receiving live NOAA weather radio. The idea is to give a computer with no soundcard the ability to stream compressed NOAA weather audio over a network. To do this he uses ezstream, icecast2 and lame. Streaming like this is great if you only want to listen to a single radio channel, and want a low bandwidth solution. Something like rtl_tcp streams the entire raw IQ data across the network which can use huge amounts of bandwidth. Streaming only MP3 audio is significantly more efficient. First the RTL-SDR is set up to receive NOAA weather audio with rtl_fm. 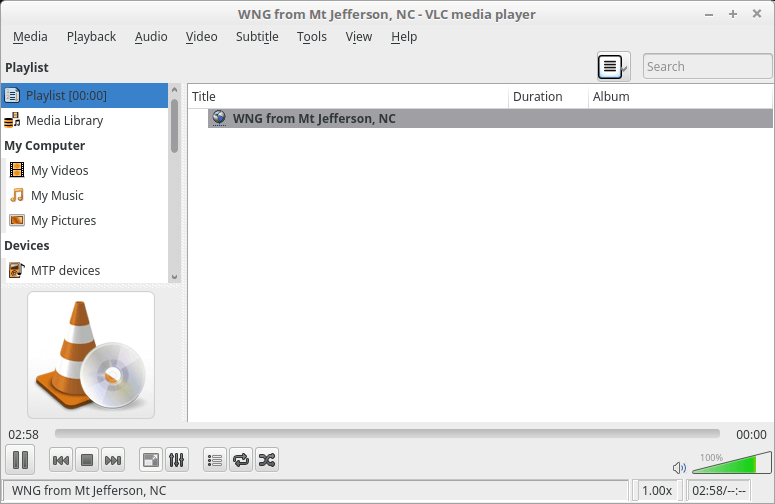 The audio is output to stdin, which is then sent to lame for encoding and MP3 compression. Next ezstream is set up to stream the encoded MP3 data via icecast. Now any PC on the network can use VLC or a similar program to connect to the stream and listen in.